Ashtanga Vinyasa Yoga is the traditional style of hatha yoga popularized by Sri K. Pattabhi Jois of Mysore, South India, (1915-2009). It has its roots in an ancient text called the Yoga Korunta, written by Vamana Rishi. This text was imparted to Sri T. Krishnamacharya in the early 1900’s by his guru, Rama Mohan Brahmachari. 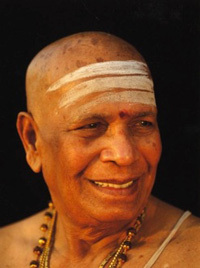 It was later passed down to Pattabhi Jois during the duration of his studies with Krishnamacharya, beginning in 1927. Mysore-Style Ashtanga Yoga is a traditional method of practice in which students practice at their individual pace while being supervised and adjusted by the teacher. New postures are taught sequentially to the student as individual strength, proficiency, commitment and humility evolve. Led class formats are also common, in which the teacher will lead a group of students through the traditional sequence of postures. In this format, students are moving and breathing in unison. The K. Pattabhi Jois Ashtanga Yoga Institute in Mysore, India is now directed by Guruji’s Grandson, Sharath Jois and guruji’s Daughter, Saraswati. Students of all levels are encouraged to travel to Mysore for practice to experience the essence of the tradition. For more information on the Mysore Institute, click here. Ashtanga Yoga is the eight-limbed path of conscious living and spiritual practice that guides one towards Self-Knowledge, liberation and cessation of personal suffering. It is presented in the Yoga Sutras which was compiled around 200 BCE by the great sage Patanjali.